Tiffany Haddish: 'I Know What I'm Supposed To Do Here On This Earth' The Girl's Trip actress has had what seems like a meteoric rise over the last year: a blockbuster movie, a gig hosting Saturday Night Live, and now a new memoir, The Last Black Unicorn. 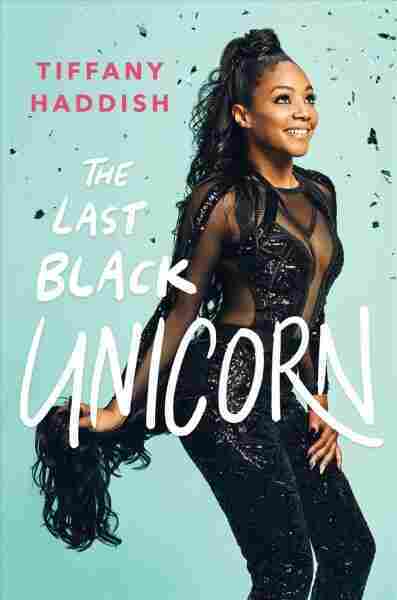 In Tiffany Haddish's new memoir, The Last Black Unicorn, she writes "I know that a lot of these stories will seem unbelievable. I look back over my life and I'm like, 'For real, that happened?'" You could just look at Tiffany Haddish's career this year and ask that question. She was the breakout star of this summer's raucous hit movie, Girl's Trip, and last month, Haddish became the first African-American woman stand-up comedian to host Saturday Night Live. On the day Tiffany Haddish swung by our New York studio for this interview, she confessed that she was flat out tired. "I gotta go do The View and then I get to go to sleep." Haddish said. ... "And I'm going to meet Whoopi, and then I'm going to be so happy and then I'm going to have the bestest of dreams!" And that's the thing about Tiffany Haddish. From the outside, she's arrived — a full-on celebrity. But inside, she still kind of seems like the girl from South Central Los Angeles who's super excited to meet Whoopi Goldberg. "Life happened for me," she says. "But I just kept pushing 'cause I know what I'm supposed to do here on this Earth." You read her memoir, and you start to understand why Tiffany Haddish had to keep pushing — through a marriage that she says turned violent and before that through years in foster care and group homes. Ultimately, it was a challenge from a social worker that put her on the path to a career in comedy. "I was getting in trouble in school," Haddish says. "She was coming up there all the time, and she was like 'You got two choices this summer, Tiffany. You can go to the Laugh Factory Comedy Camp or you can go to psychiatric therapy — which one you want to do?'" He said, 'Look, people don't come to comedy shows because they want to hear about your problems, or politics or religion. They come to have fun, so when you're on stage, you need to be having fun. If you're having fun, the audience is having fun.' And then as I got older I started realizing, 'Oh man. I'ma try to do this in everything in life because once I started having fun onstage, you know, people were nice to me. People were kind; it was easier to move forward. I've built a whole career off of being funny, trying to, you know, keep from getting punched. Yeah, it changed my life tremendously. I mean, but at the same time like ... I was with her for a few years before we got taken away from her, so that's where I feel like I really developed my comedy chops because I figured if I make her laugh, you know, she won't hit me. You know, when you have a brain injury it's very hard, and especially if before the injury you were a very intellectual, intelligent person that has an excellent vocabulary, and then you can't pull your words anymore and you get frustrated. And she would hit and stuff, and like I would just try to — if I could make her laugh then I probably won't get hit. But I'm grateful for the experience though. You know like, I've built a whole career off of being funny, trying to, you know, keep from getting punched. That marriage, man, which I didn't — I was like debating, like, going back and forth like maybe we shouldn't even put that in there ... I was there for some years. It wasn't always bad, also you know this could probably help someone who's going through some relationship like that. I mean, it is what it is. I hope a little girl or little boy reads this and be like, 'My life is hard, but it ain't that hard. If she could survive that, I could survive anything.' Because I honestly believe in my heart that it's all about how you think, like your thoughts are what either have you excel in life or have you fail in life. I just feel like it'll really help somebody, and if not, it'll give people something to talk about. This story was edited by Shannon Rhoades, produced by Justin Richmond, and adapted for the Web by Sydnee Monday and Petra Mayer.